We've all heard of the tradition of naughty children receiving lumps of coal for Christmas, but how did coal end up becoming part of the festive rhetoric? Well, it seems that there is no definite origin and many countries have their own story as to why coal has such significance at this time of the year. 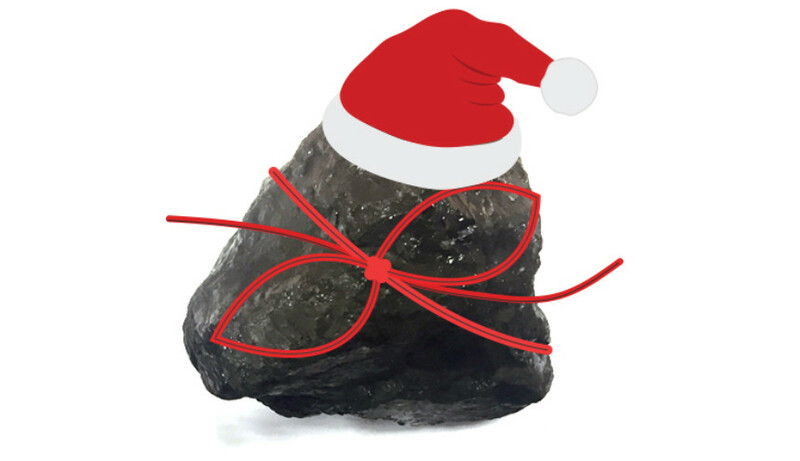 The lump of coal tradition predates the Santa that we know today and is associated with many Christmas characters that permeate European cultures including Befana, St Nicholas and Krampus. However, one thing all these legends have in common is that they enter people's homes via the chimney, which goes someway to explaining why they leave naughty children coal. In case you haven't heard of all these legends, here’s a brief description of some of them. In Italy, the children's presents are delivered by the good witch Befana. According to legend, the three wise men visited Befana on their way to the manger. She gave them a place to stay for the night but when they asked her to go with them, she decided not to go as she had too much housework to do. Befana quickly came to regret her decision so gathered some gifts for they baby and tried to find him. However, she was unable to. Befana has been searching for the baby Jesus ever since. She flies around on her broomstick searching all the houses and leaves gifts for the children. She enters through the chimney and leaves treats for well behaved children but reaches into the fireplace to give a lump of coal to the naughty to children. The coal is meant to remind them to be better behaved in the next year. Perhaps the most famous Christmas legend is that of St Nicholas, or Sinterklauss, which has since become Santa Claus. This originates in Turkey where there was poor man who had three daughters. He could not afford a dowry for his daughters and therefore none of them were able marry. St Nicholas decided to gift the family with a bag of gold by dropping it down their chimney, so the oldest daughter could then get married. The bag happened to land in a stocking that had been hung by the fire to dry. St Nicholas then repeated this for the poor man's other two daughters. Word spread and people began to put stockings up by the fire in the hope that they would also receive gifts. The legend has since become Santa Claus who comes down the chimney, where he can pick up a piece of coal for those undeserving of presents. In some European countries, such as Austria, Croatia and Hungary, St Nicholas is accompanied by Krampus, a half goat half demon. Whilst St Nicholas rewards the good children, it is Krampus who punishes the naughty ones with a lump of coal. We hope you have been good this year and don’t receive a visit from Krampus!